Bushy Park020 8979 1586work ParkWith an area of 445 hectares (1,099 acres). Bushy is the second largest of the Royal Parks. Lying to the north of Hampton Court Palace, the park, has a distinctly rural character and is home to around 320 free-roaming deer. The famous Arethusa 'Diana' Fountain forms the centrepiece to the famous Chestnut Avenue. Bushy Park is the 'Sleeping Beauty' of the Royal Parks. It is a truly grand landscape, which mixes formal avenues, statues and gardens with the wild appeal of a country park. Now open to the public for the very first time. 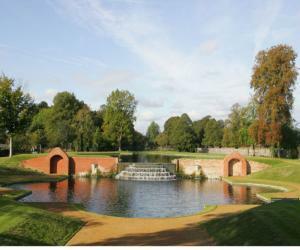 The Upper Lodge Water gardens comprise of a Baroque-style collection of pools, cascades, basins and a canal. With an area of 445 hectares (1,099 acres). Bushy is the second largest of the Royal Parks. Lying to the north of Hampton Court Palace, the park, has a distinctly rural character and is home to around 320 free-roaming deer. The famous Arethusa 'Diana' Fountain forms the centrepiece to the famous Chestnut Avenue. Bushy Park is the 'Sleeping Beauty' of the Royal Parks. It is a truly grand landscape, which mixes formal avenues, statues and gardens with the wild appeal of a country park. The Water Gardens are open from 9:00am until dusk every day except Mondays (Bank Holidays excepted, when the gardens will be closed on Tuesdays).